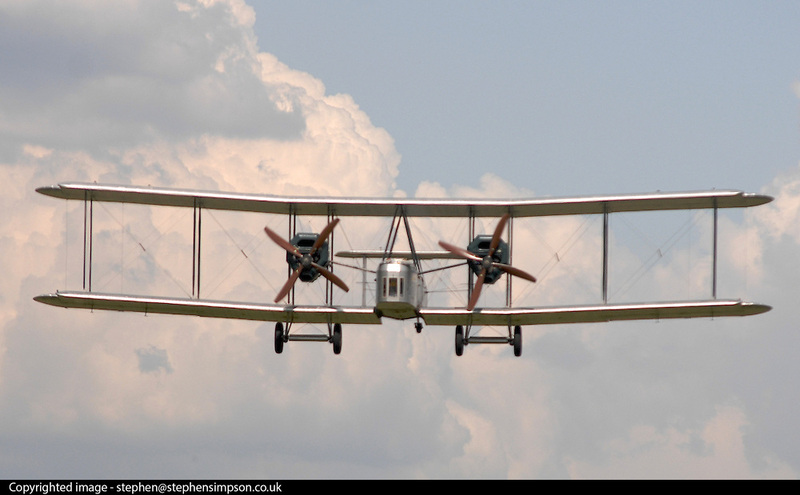 British aviators Alcock and Brown made the first non-stop Transatlantic flight in June 1919. . They flew a modified World War I Vickers Vimy bomber from St. John's, Newfoundland and Labrador to Clifden, Ireland. Winston Churchill presented them with theDaily Mail prize  for the first crossing of the Atlantic Ocean in "less than 72 consecutive hours" and they were knighted by King George V. The flight nearly ended in disaster several times owing to engine trouble, fog, snow and ice. It was only saved by Brown's continual climbing out on the wings to remove ice from the engine air intakes and by Alcock's excellent piloting despite extremely poor visibility at times and even snow filling the open cockpit. The aircraft was badly damaged upon arrival due to the attempt to land in what appeared from the air to be a suitable green field but which turned out to be the bog on Derrygimlagh Moor, but neither of the airmen was hurt...This flyable modern reproduction was made in Australia & the USA for Peter McMillan in 1994 with the specific aim of re-enacting the type's three long distance flights of 1919-20. Construction was led by John LaNoue and first flight was made at Hamilton AFB, California by Peter Hoare and Lang Kidby on 30th July 1994...First seen at Brooklands on 27 August 1994, just before its epic 75th anniversary flight to Australia, it returned briefly in Summer 1999 then successfully flew to South Africa and on 2nd/3rd July 2005, it achieved its owner's ultimate aim when Steve Fossett and Mark Rebholz successfully re-enacted Alcock & Brown's trans-Atlantic flight from St Johns, Newfoundland to Clifden, Ireland in just under 19 hours! One week later, NX71MY was flown into Dunsfold by Peter McMillan and John LaNoue...This historic aeroplane is currently being maintained to airworthy standards at Dunsfold Park by Brooklands Museum volunteers..